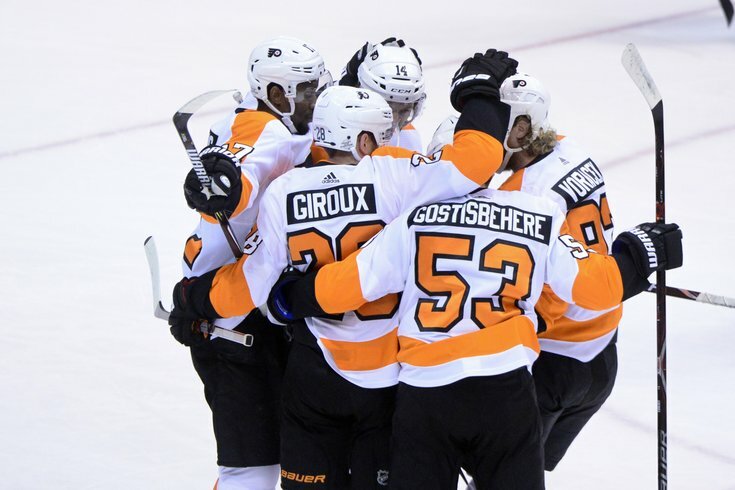 The Philadelphia Flyers celebrate after a power play goal from Claude Giroux against the Arizona Coyotes. Back in early December, all seemed lost. The season, shot. A little past the quarter mark of the NHL schedule, the Flyers were floundering, losers of 10-straight games and sitting at the bottom of the Metropolitan Division – and near the bottom of the NHL – with an 8-11-7 record. Throughout, the Flyers maintained that they were playing well. Even general manager Ron Hextall said he liked some of the things he saw from his struggling club, despite their unsatisfactory record. And it looks like they may have been right. Over the last two months, the Flyers are 20-8-2, including Sunday night’s impressive 4-1 victory over Las Vegas— in Las Vegas, where the Golden Knights have only lost three previous times. They’ve climbed from last place into a firm playoff spot in the Eastern Conference, sitting third in the Metropolitan with a 28-19-9 record, good enough for 65 points, slightly ahead of wild card contenders New Jersey (62 points) and Carolina (61). Since Dec. 4, the Flyers have the best record in the Metropolitan Division with 42 points, followed by Washington (17-7-5, 39 points), Pittsburgh (17-12-1, 35), Carolina (15-12-4, 34) and the New York Rangers (14-14-2, 31). They’ve done it with performances like last night, where, for the first time since October 2014, the Flyers scored four goals or more on 18 or fewer shots on net. They beat Detroit 4-2 on that occasion with 17 shots on Oct. 25, 2014 in Philadelphia. The last time it happened on the road was Oct. 18, 2008, when the Flyers scored four on 17 shots in a 5-4 overtime loss at San Jose. Their last road win under these circumstances was Nov. 15, 2006 in a 7-4 win at Anaheim, where the seven goals came on just 16 shots. Against the Golden Knights, the line of Sean Couturier (1-2-3), Claude Giroux (1-1-2) and Travis Konecny (0-2-2) combined for seven points (2G, 5A), in comparison to Vegas’ top line of Reilly Smith (0-0-0), William Karlsson (0-1-1) and Jonathan Marchessault (0-0-0). The second line of Jake Voracek, Nolan Patrick and Wayne Simmonds has also been very productive. In the Flyers’ 4-3 shootout win over Arizona on Saturday, a game in which Michal Neuvirth became the first goalie in NHL history come into a game during a shootout and earned a win (a goaltender has entered a game during a shootout five times previously, but all were losses), Patrick provided the game-winner. In the shootout win over Arizona, the Flyers’ first this year, Patrick played 18:42, nearly two minutes more than his previous season/career high. The 6-foot-2, 200-pound 19-year-old is beginning to turn into the player the Flyers expected. The Patrick line was very dominant in the second of the Arizona game. Patrick was hard to knock off the puck and was far more assertive defensively. The one glaring concern moving forward is the condition of goaltender Brian Elliott, who suffered a lower-body injury during the shootout. His condition is yet to be determined. Neuvirth came on to win the shootout, stopping five shots, and then was amazing against Las Vegas, making 38 saves. The Flyers host New Jersey on Tuesday night in their fourth and final meeting of the season. The Flyers are 2-1 against the Devils in their previous three matchups.